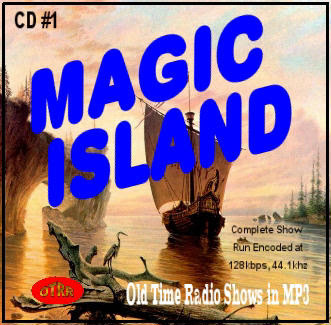 Magic Island was a syndicated serial that first aired sometime in 1936 and consisted of one hundred thirty 12-minute episodes. The storyline dealt with a wealthy woman and her search for her long lost daughter. She finds her on a man-made island that can submerge to avoid detection. The series was targeted for a juvenile audience and small children are the main focus of the story line. Everyone on the ship, including Mrs. Gregory's husband and little one-year old, were believed lost -- all except Mrs. Gregory. Fourteen years after her rescue, Mrs. Gregory still has not given up hope. In reality, Joan has survived by living on a man-made, "magic" Island that is so secretive, that it can submerge under the water in order to evade exposure. This serial radio show follows the story of the reunion of daughter and mother and the adventures that come there after.